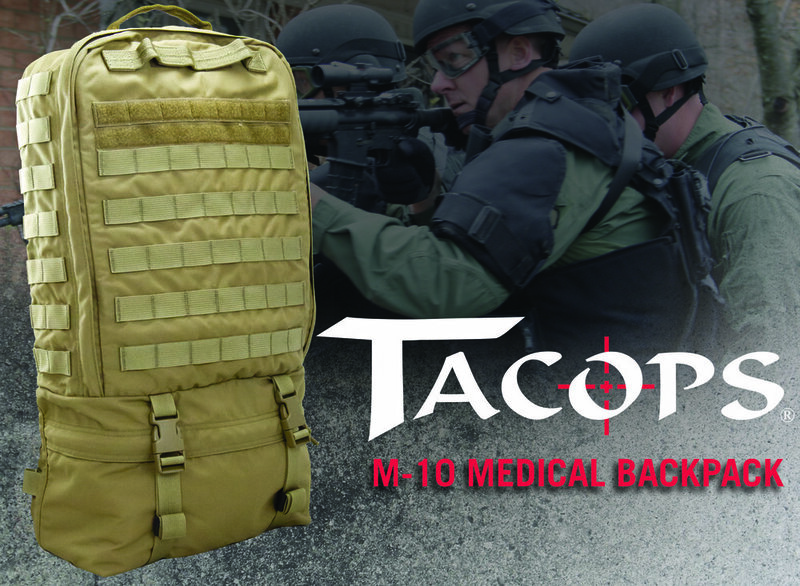 TSSi is pleased to announce the release of its newest TACOPS® product, the M-10 Medical Backpack. Debuting at the 2017 SHOT Show in Las Vegas, NV, the TSSi M-10 Medical Backpack is based on the design of the TACOPS® M-9 Assault Medical Backpack but with significantly more internal storage space, more external PALS webbing to attach accessory pouches, new internal pouch options, and additional capabilities resulting from its increased size. Over a decade ago, TSSi designed the M-9 Assault Medical Backpack in conjunction with a U.S. Army Special Operation Command medic for his own unit’s use. It quickly became the medical bag of choice for special forces and civilian SWAT medics. As the diversity of M-9 end-users and operational missions expanded, so too did the amount of medical equipment that was being placed inside of it. Medics stuffing the M-9 until it “looked like a tick that was ready to burst” became the norm in many organizations. While still the operational medic bag of choice, its capacity was being pushed to the limit. has only increased in depth by just over 1 inch. However, the overall internal capacity has doubled with the expansion of the lower compartment by an additional 3 inches. The M-10 Medical Backpack can be ordered with a variety of pouch options for the internal layout as well as user-customized medical equipment load outs. Representative at sales@tssi-ops or toll-free 1-877 535-8774.